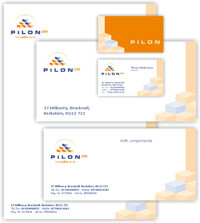 PiLON is one of the most dynamic and competitive refurbishment services in the UK. We provided ID creation services to this Berkshire based Building Company. This included Logo Design as seen here, along with stationery design (below). Client Comments: "Our company logo has been very well appreciated by our clients and that in itself made us happy. Talented designers cost effective design services that we would wholeheartedly recommend to our customers and friends." Florian Moldoveanu - Pilon Ltd, Bracknell. You may also be interested in web design and hosting services for builders and UK business. Are you a builder based in the UK? To express interest in logo and stationery design services for builders - you may use our logo design enquiry form. Alternatively, call us from Monday to Friday 9:00 - 18:00 on 0117 9042796.